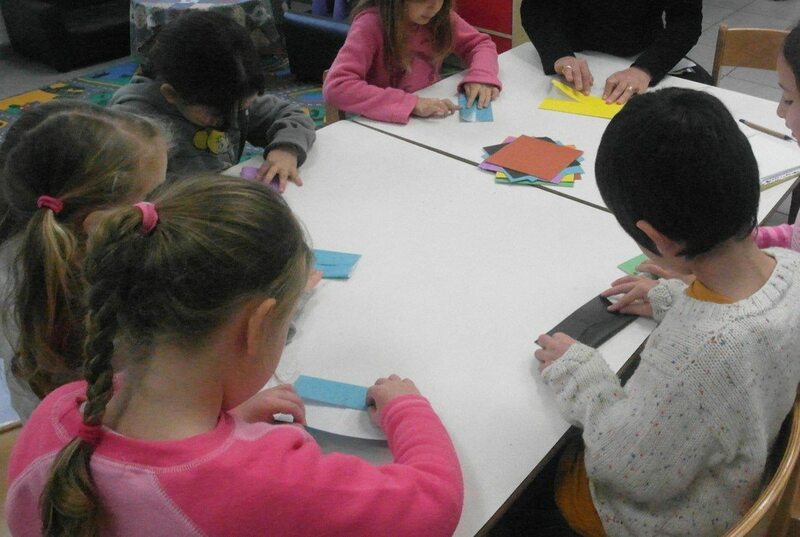 As the children have continued practice with folding they are able to do the folding exactly as needed. 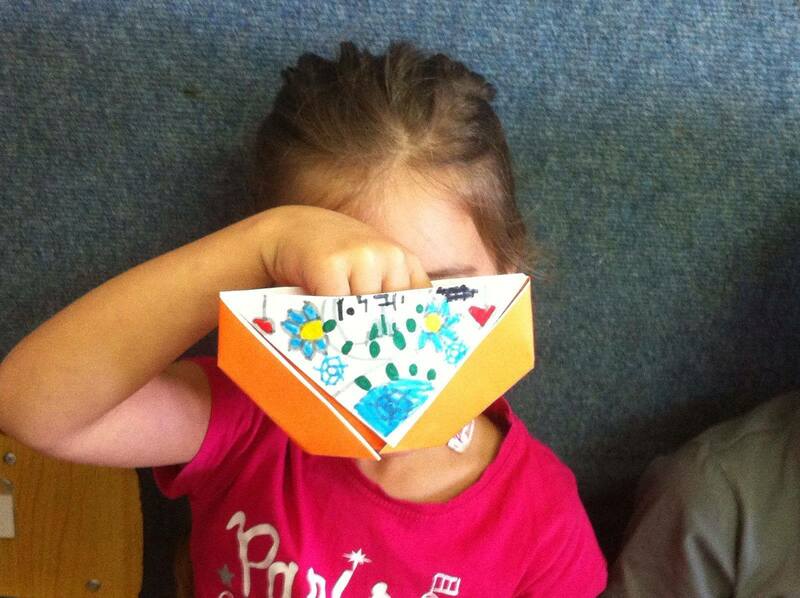 In the picture we can see how a child has advanced from stage 1 to stage 8 in the folding process. 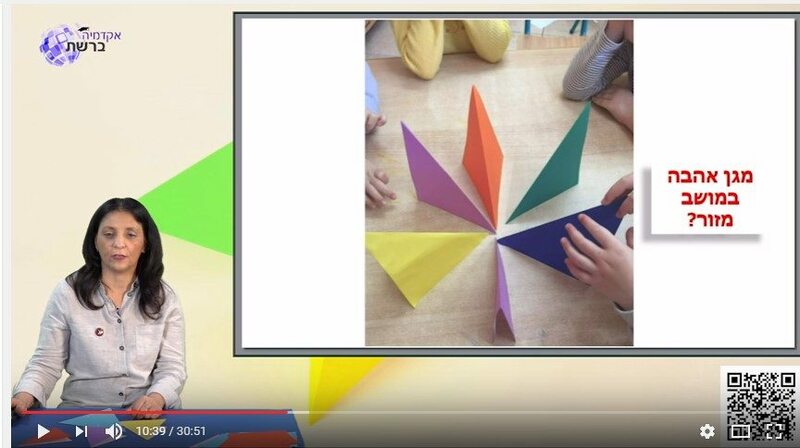 A discussion question: Ask the children to describe their triangular shape. Answer: The children count three sides and three vertices giving the name triangle to this shape. 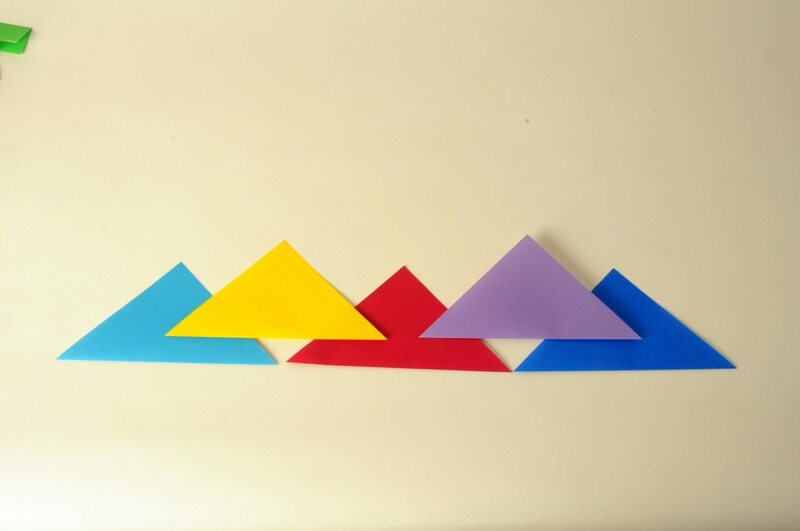 Composition and decomposition: Each child should join the two folded triangles to form a new shape. Only the complete equal sides should be joined. Ask the children to count the number of sides and vertices of their new shape. 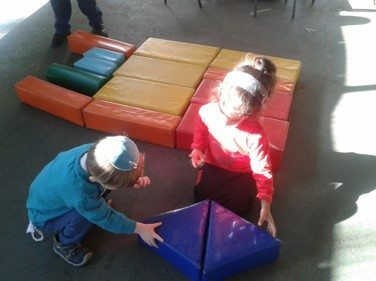 The children classify their new shapes according to the number of vertices and sides. A four sided figure is named a quadrilateral -sometimes a square,rectangle or parallelogram. 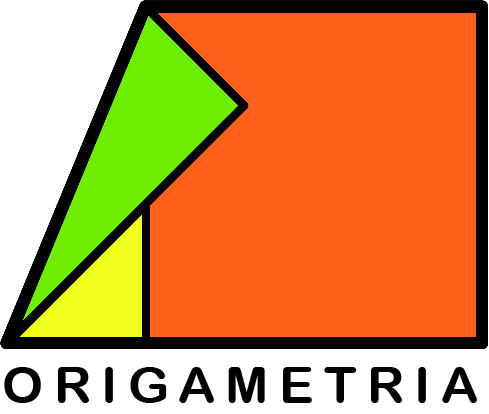 The three sided polygon keeps the name triangle. Folding instructions: On one of the triangles fold opposite vertices as shown. 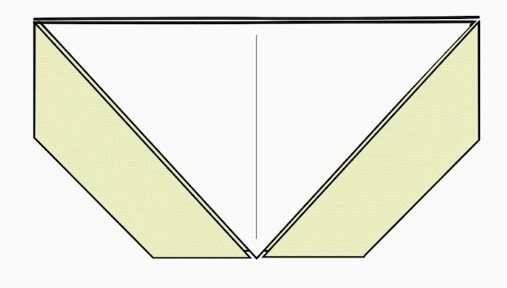 Folding instructions: Fold the two vertices to the line of symmetry as shown. The children are not familiar with the term symmetry so this line should be pointed out. 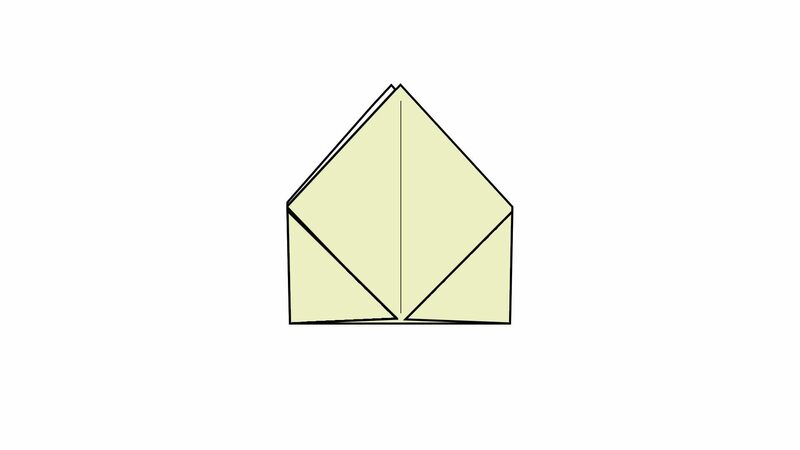 A discussion question: What are the number of vertices and sides of this folded shape? Use only the correct terms. 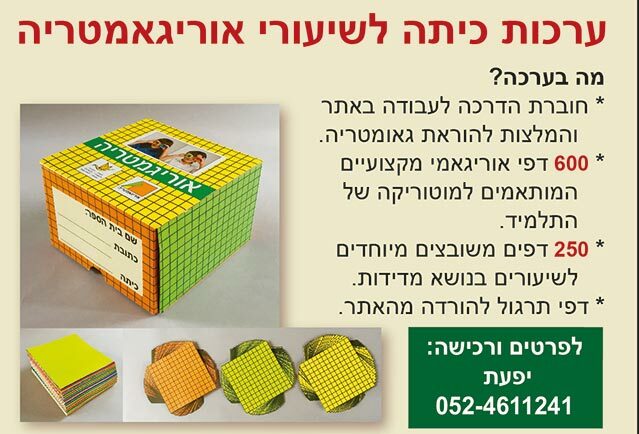 Answer: The children count 5 vertices and 5 sides. and give the shape the name pentagon. A discussion question: Can you find other shapes in the folded shape with 3 sides and 3 vertices? 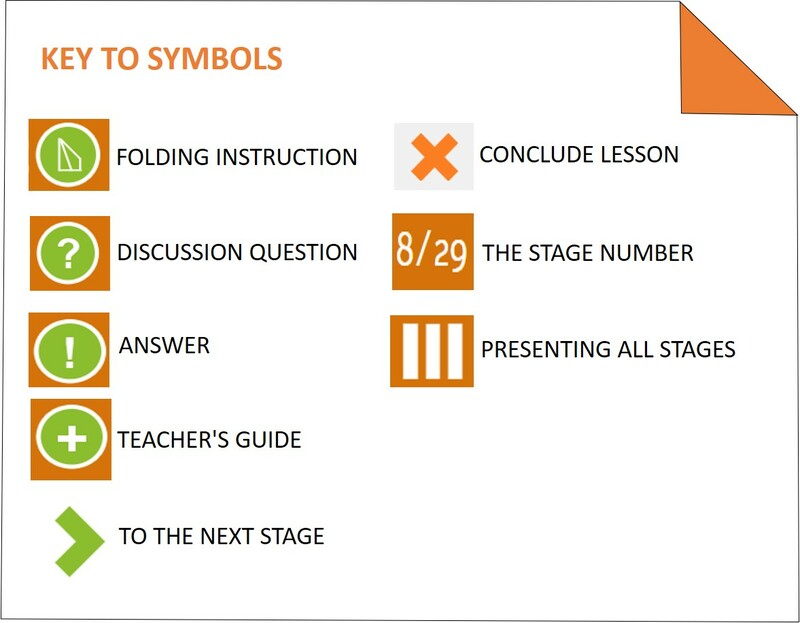 Continue to use the correct geometrical terms in each activity and discussion. 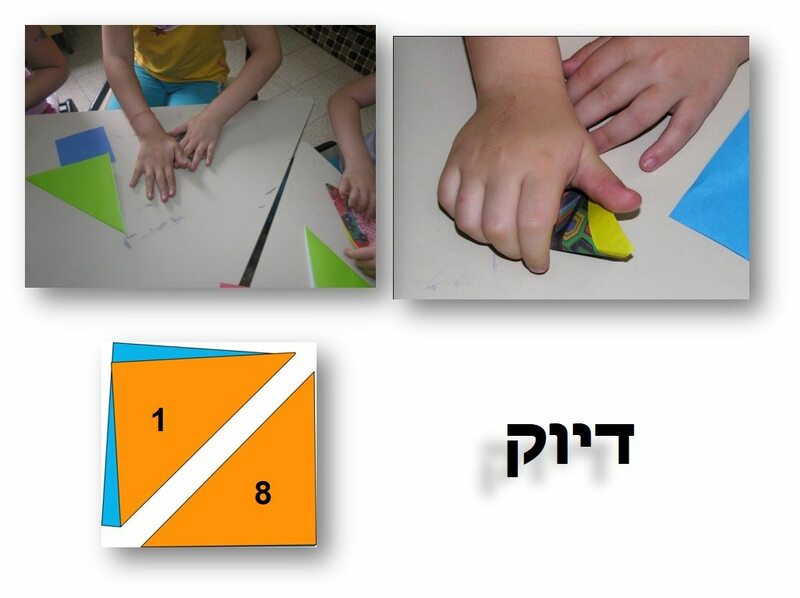 Answer: The children count three sides and vertices and describe what they have found as triangles. 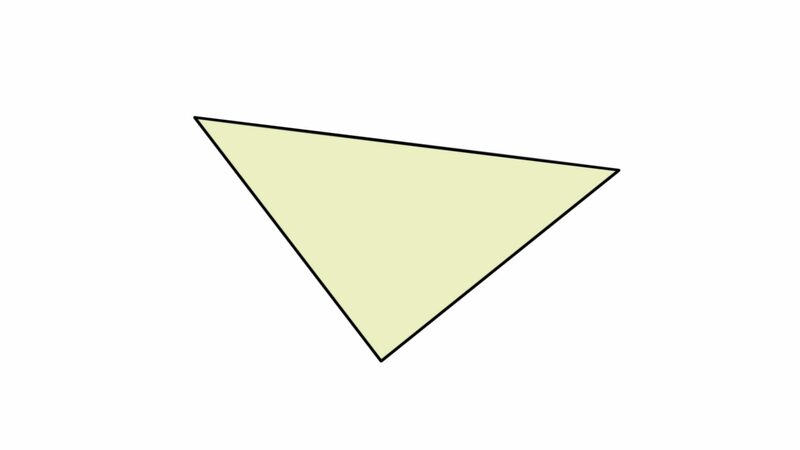 The animation shows only one triangle but 4 triangles can be seen. A discussion question: Can the children identify 4 sided shapes with 4 vertices? Answer 1: The children identify quadrilaterals with 4 sides and 4 vertices. The quadrilateral that can be seen is a right angled trapezoid. In the next stage another different quadrilateral can be seen. Answer 2: Another quadrilateral can be seen having 4 sides and 4 vertices. A square. 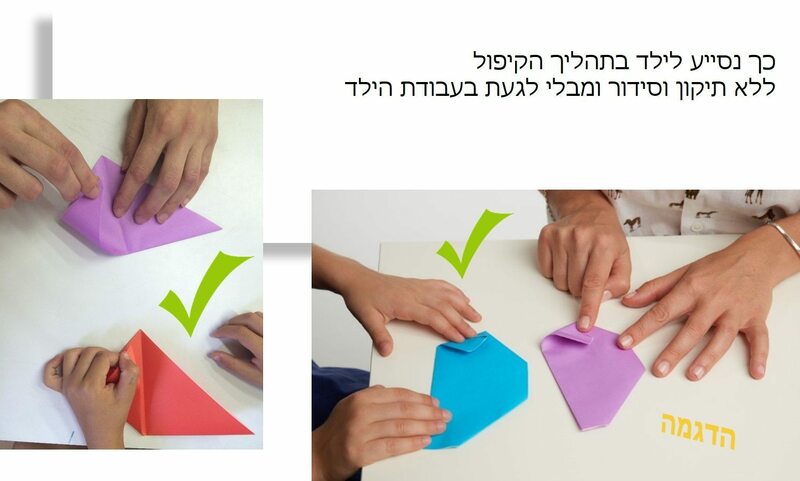 Folding instructions: Fold the vertices as shown. Folding instructions: Fold back one of the triangles. Folding instruction: Fold 2 vertices as shown. Folding instruction: Turn over your shape. A discussion question: Can you find a new polygon in this folded shape? The new polygon is a hexagon. 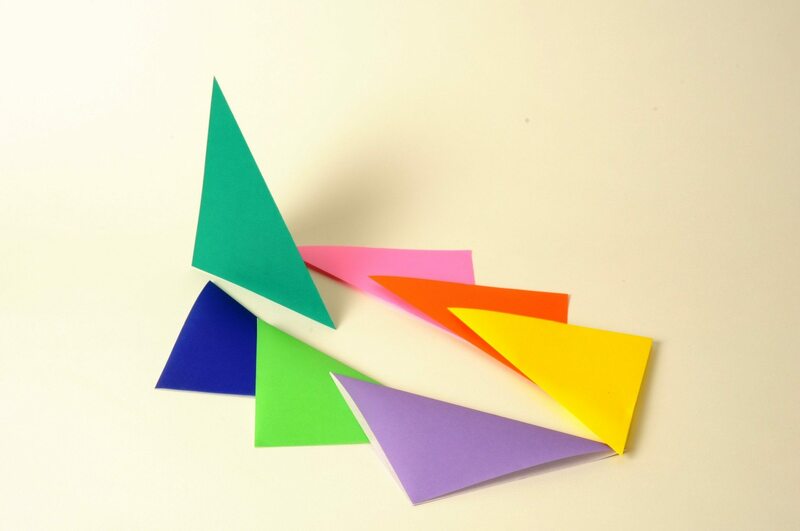 Children should choose a vertex to begin their “journey” around the shape changing the direction of movement at each vertex until returning to the starting point. 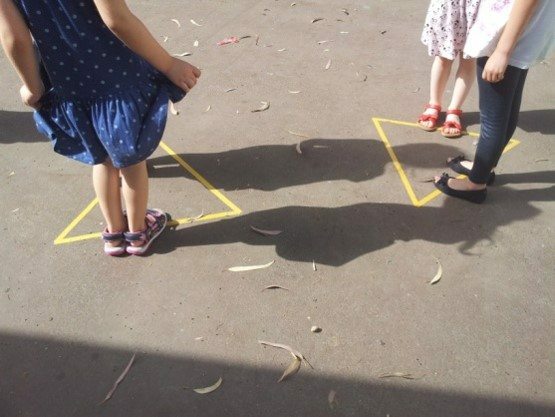 Answer: We have found a 6 sided polygon. A hexagon. 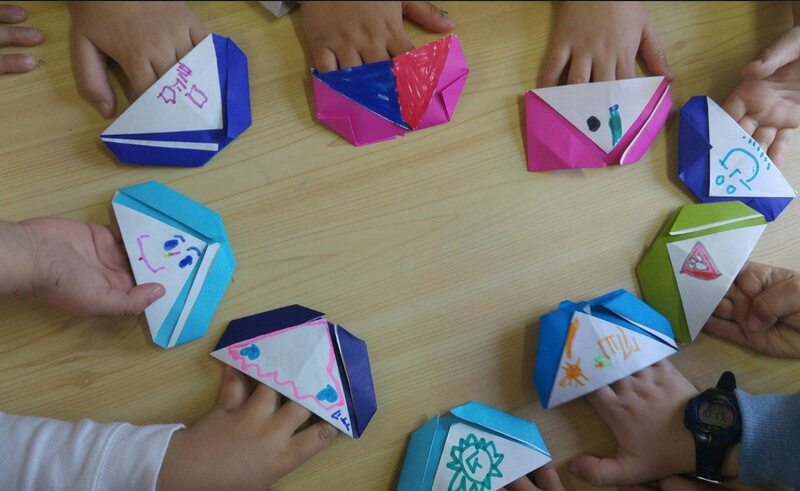 Folding instructions: Place your fingers into the pocket of the shape. 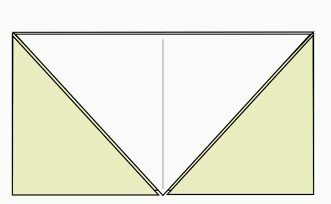 Folding instruction: Fold out the two triangles as shown. 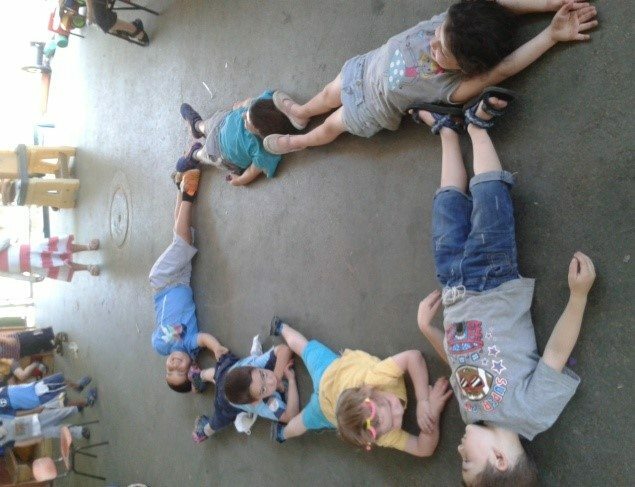 Children should decide which name can be given to this shape. 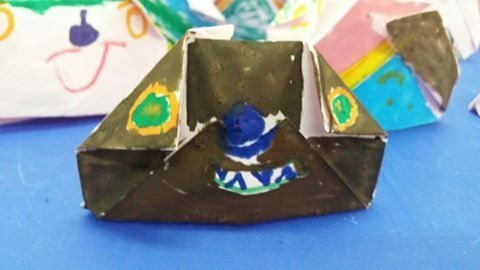 The Model: Each child can decorate his shape according to his imagination. Children describe verbally their decorated model. A suggestion for developing the concept of a polygon. The next lesson is Polygons 2. Recognition of polygons according to number of sides and vertices. Folding stages in identification of polygons and investigation of the triangle.